Vienna State Ballet first soloists Olga Esina and Roman Lazik, via YouTube. Vienna really knows how to ring in the New Year with its annual concert by the Vienna Philharmonic, filled with the waltzes of the Strauss family and other composers. The best part? Broadcasts of the event (shown in the U.S. on PBS) also include interludes of ballet. On January 1, catch dancing from the Vienna State Ballet on PBS' Great Performances' "From Vienna: The New Year's Celebration 2019" (check local TV listings). (Editors Note: You can now watch the full 2019 concert here!) In the meantime, here is a collection of gorgeous videos from New Years' past. Marcelo Gomes' clean technique, skilled partnering and magnetic stage presence make him one of the world's most versatile and in-demand male dancers of his generation. This year saw the principal dancer celebrate his 20th anniversary with American Ballet Theatre, a company he joined at just 17 years old. Coinciding with this milestone was the release of the feature length documentary Anatomy of a Male Ballet Dancer, created by the two-man team David Barba and James Pellerito—who actually approached Gomes via Facebook. The documentary, which was seven years in the making, has been making the film-festival circuit this year, most recently August 6 at the Jacob's Pillow Dance Festival. The film combines intimate interviews with backstage and rehearsal footage and archival video. It focuses on Gomes' skill and prowess as a partner and includes interviews with some of the world's top ballerinas including Diana Vishneva, Polina Semionova and Misty Copeland. 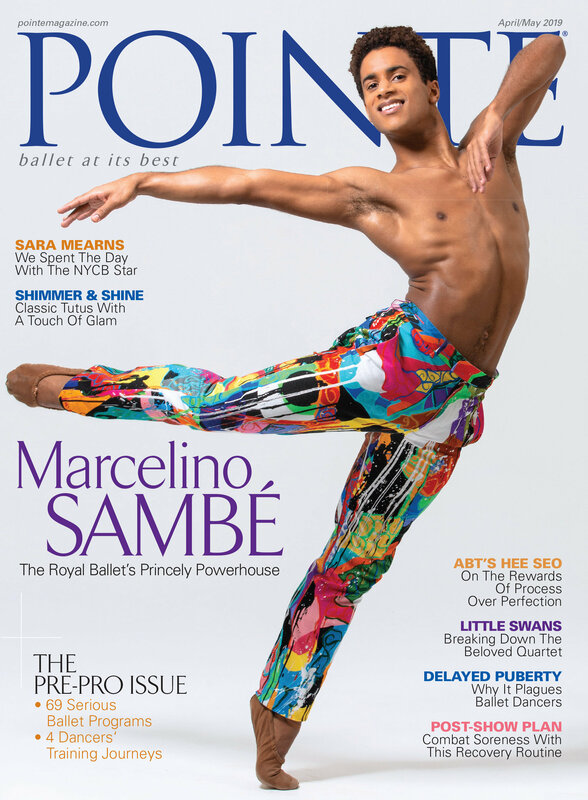 For this #MotivationMonday, we mined the “Reverence" section of Pointe's back issues. Read on for inspiration from some of your favorite dancers. This years-old advice is timeless! Marius Petipa’s original version of La Bayadère, which premiered in St. Petersburg in 1877, was meant to evoke the exotic Far East. Today’s productions have no shortage of tropes that Westerners might associate with a royal Indian court: elephants, rajahs, midriffs and opium dreams. The first time I saw La Bayadère, it was not the fantastical setting I found so mesmerizing, but the dancers underneath the layers of intrigue, silk and jewels. Polina Semionova, an American Ballet Theatre principal and Mikhailovsky Theatre guest artist, is particularly captivating as La Bayadère’s heroine, the lovelorn and doomed Nikiya. In the variation preceding the Nikiya’s death, Semionova’s lithe figure undulates—not unlike the snake whose deadly bite is the character’s fate—and melts effortlessly into each supple lunge and backbend. The lyrical choreography exhibits Semionova’s usual flawless lines, and she embodies Nikiya’s desperation in the way she clutches her neck and bows pleadingly towards Solor. Watching this video, I can hardly tear my eyes away from the seductive, simple way Semionova peels one perfectly arched foot off the floor, steps to sous-sus and twists her graceful arms overhead. Happy #ThrowbackThursday! Last April when Staatsballett Berlin principal Polina Semionova made her NYC debut performing in the Youth America Grand Prix gala, her mere appearance on the stage elicited screams of delight from the aspiring dancers in the audience. They knew the young star from a video, “Demo (Letzter Tag),” in which she dances a sweet and expressive solo to music by popular German musician and actor Herbert Grönemeyer. The video has been viewed by close to 1.5 million people on YouTube, making Semionova more popular on the internet site than Sylvie Guillem, Alessandra Ferri or Natalia Makarova. In September I had a chance to observe the young ballerina in company class and rehearsal in Berlin and to talk with her about her dancing. In person, she is both appreciative and animated, the first to acknowledge that luck has played a role in the chain of events that propelled her to fame. At 24, Semionova says she now carefully calculates pluses and minuses before making big decisions, but the opportunity to do the Grönemeyer video came before she gained such maturity. “I was so young!” she laughs when asked if the project came from a desire to reach new audiences for ballet. “I was 18 and had just joined the company. It was supposed to be a different dancer, Nadja Saidakova, but she was injured and I was the third or fourth choice.” And though she had no idea how much the video would be watched, Semionova is happy that “people who are not interested in ballet watch it and think of coming to the theater,” she says. Serendipity is a recurring theme in Semionova’s story. As a child growing up in Moscow, she and her older brother Dmitry loved sports, especially ice-skating, while her younger sister studied music. When Dmitry’s coach recommended that his tall stature was better suited to ballet stages than ice rinks, Semionova was forced to switch pursuits as well. “Three children in three schools? This would have been too difficult for my parents, so I ended up in ballet. I cried because I loved ice-skating.” Again she laughed at the synchronicity: her proportions, like her brother’s, are perfect for ballet. Accepted at The Bolshoi Ballet Academy, Semionova worked hard but was not at the top of her class. She credits the three international competitions she participated in (Moscow, Vaganova-Prix in St. Petersburg and Nagoya) with giving her the opportunity to find herself and realize her abilities. “He was preparing his son for the first Moscow International Ballet Competition, and asked me to be his son’s partner. I had never done solos or pas de deux before. Yuri had me run the variations three times in a row to make sure I had enough strength.” At the same time, she recalls going through a growth spurt that left her weak. “I was shaking after each pas de deux,” she says. When her teacher and director of the school, Sofia Golovkina, heard that Semionova was planning to attend the competition, she disapproved and forbade her to go, saying she would throw her out of class. But Semionova went, albeit crying, and was awarded the 2001 junior division gold medal. When she returned to class, Semionova recalls that Golovkina said, “You won,” meaning not only the competition, but the right to make her own decisions. Semionova was rehearsing with her brother Dmitry (he has been a principal with the company since 2007) but she will dance with the artistic director of the Staatsballett, Vladimir Malakhov, in the gala. Since becoming director in 2002, Malakhov has changed the look of ballet in Berlin: He guided the city’s transition from three troupes into one, and has attracted a younger, more stylish audience through smart programming and marketing. In many ways, Semionova’s rise to acclaim has paralleled Malakhov’s success, and offstage, Malakhov smoothed her transition from Russia to Europe. When she arrived, not speaking a word of English or German, he was not only her director, but also a friend. Both Semionova and Malakhov were trained at The Bolshoi Ballet Academy and also share unique similarities in their physiques and movement. When Malakhov visited his alma mater in 2001, he was attracted to the way Semionova approached her work. Malakhov liked the way she worked so much that he offered her a contract to join the Staatsballett as a principal. She also received offers from The Kirov Ballet and The Bolshoi Ballet, the company that Golovkina expected her to join. Practicing what she preaches, Semionova was a study in perpetual motion during the class I watched. There is an ease and perfection in her movement, which makes it difficult to watch anyone else in the studio. She plays with qualities of movement: sometimes slicing her leg to the side in a staccato manner, other times letting a grand battement float up to her arm in high fifth, seemingly effortlessly. Her legs appear attached to her body with pliable elastics. Her turns are similarly smooth: four or five pirouettes coast around rather than spin forcefully. Berlin is an apt home for this talented artist: The opera house is situated between the Brandenburg Gate, a historical landmark in the city, and Alexanderplatz, a commercial center. Semionova herself seems to straddle different worlds: from her exquisite Russian training to her presence on YouTube and Facebook. As she explores traditional ballets such as Giselle and Swan Lake, she also reaches younger audiences with new forms of technology and communication—she is a link between the past and the future. Kate Mattingly teaches and writes about dance in the United States and in Europe. Roberto Bolle's gala "Roberto Bolle and Friends" had its annual performance today, in Verona, Italy. The performance featured an outstanding cast of dancers, including American Ballet Theatre's Hee Seo, Cory Stearns, Daniil Simkin and Julie Kent, Boston Ballet principal Eris Nezha, Stuttgart Ballet principals Alicia Amatriain and Jason Reilly, and ABT corps member, Skylar Brandt. A highlight of the evening included a performance of Fabrizio Ferri's short dance film Passage, re-staged for a live audience. The pas de deux features Bolle, and ABT Principal and Mikhailovsky Ballet guest artist Polina Seminova.